I've have been blogging about nail art for approximately 3 years as of date and I've had a good share of instances wherein my photos have been grabbed and edited without my consent. For a time, it was easy to set my frustrations aside. 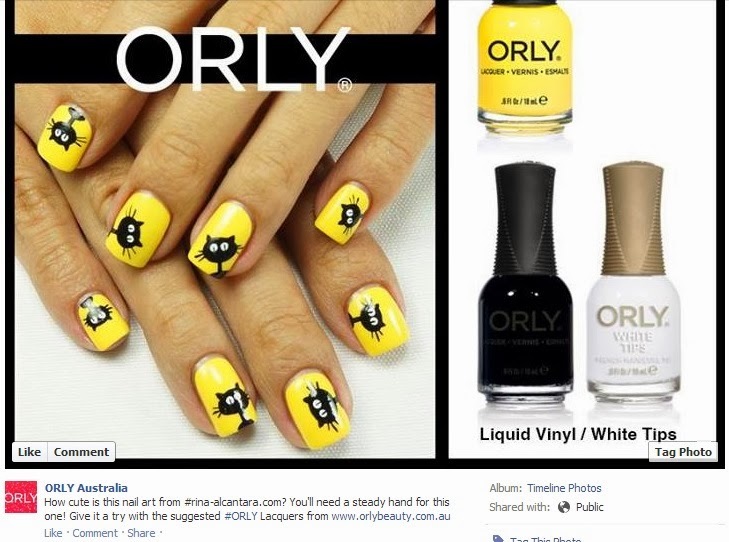 But when a big company such as Orly commits copyright infringement using one of my nail art photos, it is hard to ignore. CLEARLY, Orly intentionally covered my watermark and replaced it with theirs. The big question is, why? Does it mean that Orly is claiming the photo as theirs? Are we suppose to assume that an established company like Orly, that deals with print ads and other forms of advertisements, does not know that stealing someone else's photo is a crime? Seriously? Some may say that Orly Australia gave me credit by mentioning my blog in the caption area. Perhaps they intended to give me some sort of consolation by at least mentioning my blog in the caption? Don't I deserve a proper tag? If they were going to mention my blog anyway, why the need to cover my watermark? It doesn't make any sense. To make matters worst, Orly Philippines followed suit! I haven't used Orly since June 2012 because of personal preference. After this incident, I know I made the right choice. The principle is easy to understand. Thou shalt not steal. With all the social media channels I have, it is NOT hard to send me a message and ask for permission. If you are too lazy to do so, at least give proper credit and DO NOT edit the original work. I may not be as famous as other artists the world so admires. But I've worked really hard to establish a good name as a nail artist in the blogosphere. The nail art designs I publish here is to inspire those who would like to embrace the craft as much as I do. As much as I encourage people to share what they see here, photos of my nail designs are NOT meant to be exploited as you please. I'm sorry that this happened. I'm sorry that it happened to me. And I'm sorry that I felt I needed to write about copyright infringement once again. This is my deal breaker as an artist. If you feel the same way that I do, please help me spread this offense made by Orly and hopefully no one else will experience the same. I know that this post will somehow spur mixed thoughts. I would love to hear your insights on this matter. So sorry this happened to you Rina. It's out of order, especially for such a big company like Orly! What's funny is that you didn't even use Orly products in the first place!! Just awful. Have you submitted copyright reports for these? I'm certain Facebook will remove the image from Orly's pages as it's very clear they've violated your copyright. I used to just report such instances to Facebook because I know they frown upon copyright infringement and they are quick to removing photos as long as I can prove ownership. BUT, removing the picture does not erase the offense ORLY did and it doesn't make everything right. If I just keep quiet, what will stop them from doing the same thing to another artist? I'm so sorry that happened, Rina. It's always bad no matter whose nail art gets used or whichever company does wrong. It's so disheartening. You have my full support! Sorry this happened to you, I'd follow what Sammy said and report the photos to Facebook. They are fantastic with copyright claims and will remove them. That is shady as hell of them to put their watermark over yours like that. Companies like Orly should know better. How rude! Unbelievable that such a big brand like Orly does something like this. They should give you more credit! You're such an artist. Wow. I just posted your wonderful freehand mani design using Dazzle Dry to my Pinterest boards at http://www.pinterest.com/pin/178032991493109279/ and http://www.pinterest.com/pin/178032991493109280/. I, of course, linked directly to your original post at http://www.rina-alcantara.com/2012/10/nail-art-black-cats-galore.html. Reading that original post of yours even sent me looking online for the Dazzle Dry products. Unfortunately, I think Orly was very clever...they gave you credit as the artist and never said that you used their product. Essentially their FB post is saying, "Here's a great design by Rina Alcantara to try with Orly products." Their lawyers made sure they weren't taking credit for either the design or the products you used. I do wonder though if Dazzle Dry would have any sort of a case. By any chance, did Dazzle Dry provide you with their polish for your review? This just reeks. It seems you're getting a lot of good advice from people who know what they're talking about. 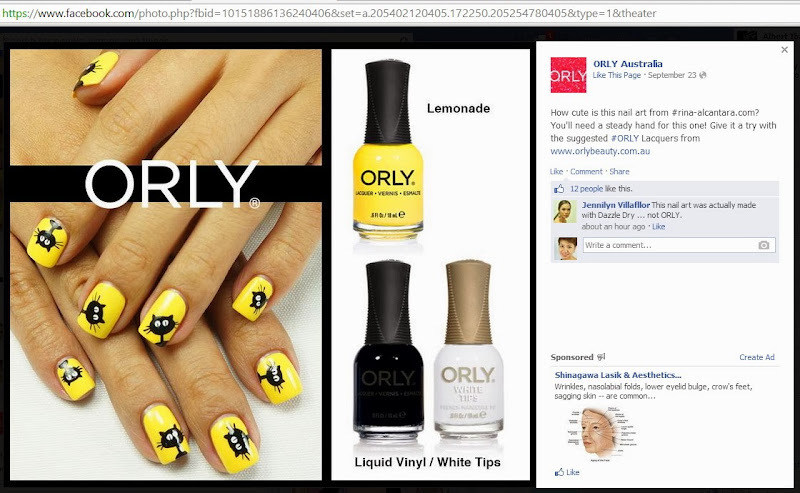 My own last (hopefully) two cents: I think a judge would think Orly Australia's covering over your watermark in their FB post is sleazy, but that it's semantics because they did acknowledge you as the mani's design creator in the caption that went along with the picture they used from your blog. You also do not have a "do not copy" warning on your blog like the one on http://www.theswatchingsprite.com (look at the bottom of the page on the left). To my own knowledge, as long as they gave you credit, they (unfortunately) can't be touched for plagiarism. BUT I do think you would have a case on the grounds that they used your mani design to boost their own profits and that you are entitled to a share of those profits. 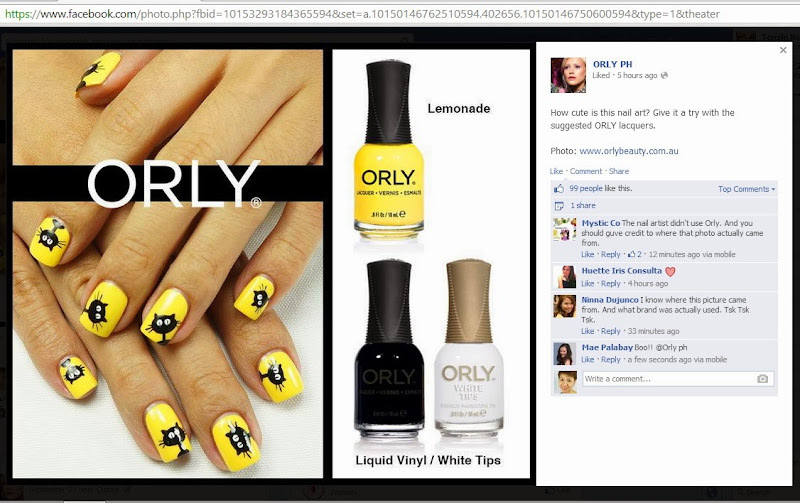 As for the FB post from Orly Philippines, from the picture you've shared here, they did not give you credit for the mani design, so I think you might have a case against them for plagiarism as well as suing for a share of their profits. If nothing else, your fighting this would make some noise that would help the next mani designer they targeted like this. It also seems you have many like-minded bloggers and others (myself included) who would be happy to help you raise the decibel level of your noise. Something else to think about: how is it that you have copies of Orly's FB posts on your own blog? I think (I am not positive) FB has their own "do not copy" warning somewhere on their own website, so you might want to verify if that's true. Even if FB doesn't, Orly might have their own "do not copy our posts" warning in place. Just make sure you are following the warnings of others before you go forward. Good luck! The photos I posted here on my blog are screenshots of Orly's violation. If anything else, they cannot say I copied or grabbed their collage/picture that actually contains my original work. Thank you very much for your insights. My website or blog explicitly contains rules on using photos or other contents. I made sure I had one when I first experienced copyright infringement. This is really sad, especially from such a large brand as Orly. They should know better, right? It really seems like they shamelessly grabbed your photo and claim it as their own, otherwise why cover your watermark? Well, now I know who not to support. Just so it's clear, Orly PH never gave credit to Rina. They credited the photo to:www.orlybeauty.com.au. The point is that they should have known better and not done this,,,it is just common courtesy. rina, it costs anywhere from 35-65 dollars to copyright your work. http://www.copyright.gov/help/faq/faq-register.html if you have a copyright on this, you can sue orly for up to 225,000 per infringement and the philippines too. I would indeed contact an attorney and ask for legal counsel. I believe you deserve to be paid, proper links given and this is a serious issue. i ask for everyone to to say 'inspired by robin moses' if they copy, but each of my designs (sans 15 or so) are mine and i have legal authority over them. it is important and i feel so bad this has to happen by such an ugly company. i do not like orly and although i never have used them in a video, i am throwing away all that i have and will not use them in any for the future. My love and support. I will be taking legal action for this and I need all the support I can get. I have thrown all my Orly polishes to the trash, too. And if people try to search them here at my blog, this article will be the first one to appear. I am happy to know that there are people who understands and take copyright infringement seriously. I recommend crowdsourcing your legal fees. Get your blog readers to pool funds for you to take legal action against the infringer. With proper legal guidance, you are guaranteed to win the case. Then - and this is crucial - DO NOT keep all the money. Donate a huge chunk of the funds to a foundation that protects artists from copyright abusers. So, what will happen is, your blog will be the vehicle to spread awareness about an artists' rights. You will NOT make money from the infringer. But it will teach them a painful lesson. And it will serve as a warning to future infringers. Readers of this blog, I hope you could help out in any way you can. This is not just for Rina, but for all of you, because you are also creators and artists. Well it happened to me to - not with Orly but with a drugstore chain - and I billed them - and they paid, end of story. It is horrible... Companies like Orly should behave better... You have my full support.. I think you should do what Sammy Tremlin and Robin Moses suggested to you.. This is so awful! I would definitely contact a lawyer and do something about this! Thank you all very much for the support. Rest assure that I will not take this matter lightly. Copyright infringement is a serious offense. As of this comment, Orly Australia have sent me a message to explain their side of the story. I am still thinking whether or not to make it public so that you may know how they responded. To me, it cannot end with them just removing the photo they infringed and with an apology. It doesn't remove the fact that they violated my rights. Am I just to believe what they said that they had no intention of infringement when they clearly covered my watermark? Again, thank you to all of you and I will continue to update you on developments. It is a farce to think a company as global as Orly would not be made aware of what infringement constitutes. If that were true, their lawyers are dolts. Besides, ignorance of the law is not an excuse. Wow, that's disappointing... I hope they are going to acknowledge their mistake and apologize! I shared it on my facebook. it's unbelievable ! I'm used to it in nail-art contest, stealing pics of someone else in order to win some polishes and other gifts... but here, I don't understand at all ! Thank you so much, Mimie! I feel very blessed to have supporters who are taking the initiative to share this to their circle. I am also doing my share by standing up for my rights, and the rights of fellow nail artists. It's about time that copyright infringement should be taken seriously. I thought Orly is a good product. Nonetheless, copyright infringement is still a crime. They should have informed you prior the post. Obviously, it could violate Creative Commons license too in case you have it. Hope everything will be fine. They violated International copyright law, and add to that whether your images was registered or not, there is a penalty for intentionally removing watermarked images (obscuring them) because it shows intent to infringe. they need to pay you for past usage licencing fee. Thank you very much for the link. It would help me as I go through the legal process Orly's copyright infringement. I appreciate your support on this. By the way, ORLY is an American based company. This is really disappointing. MissJenFabulos at least copies the design to her nails! Shame on you Orly! But what missjenfabulous does is still a violation of intellectual property and even copyright infringement. She takes the creation and copies it to her own nails, yes. But then she slaps her watermark on it and claims design as her own. She has made a career out of this. We even suspect she stole a design from Rina. A lot of the artists she steals from can't afford to fight her. So I will just expose her.